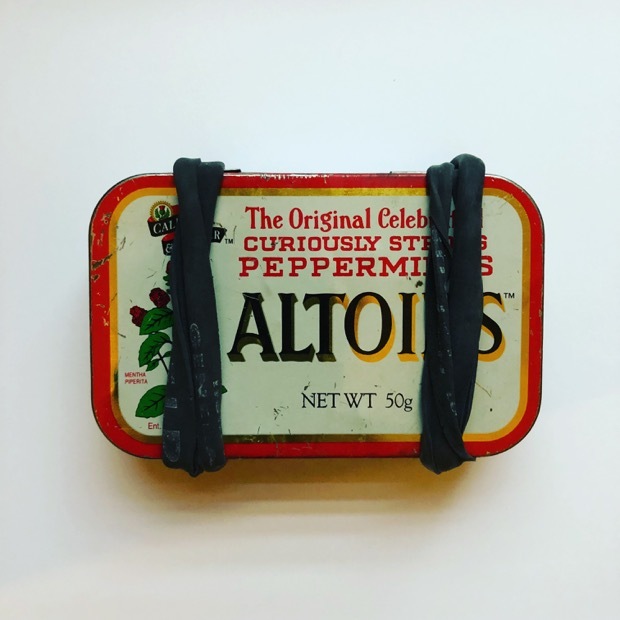 Wherever I travel, this battered Altoids tin comes with me. Open it and you'll find various objects that can and have come in handy over the years. Here's a breakdown of what's currently inside. A couple of plasters I was recently on a photo shoot and one of the models was getting a blister from the new shoes she was modelling. When she asked "don't suppose anyone has any plasters on them? ", she wasn't expecting me to say yes, let me check my tin. Spare cash I always try and make sure there's a twenty quid note in there. Has come in handy numerous times, especially in taxis. Emergency Credit Card I have a credit card that is completely clear and is only to be sued for absolute emergencies and I store it in the bottom of the tin, which fits perfectly. Print of my passport details Great to have a copy digitally as well, but always nice to have a print out should digital things fail — which they do a lot. Formcard This is thermo plastic in a convenient credit card size. Heat it up in a cup of hot water and you can mould it to fix things in emergencies. Sets in seconds. Paper clips I used these once to do an emergency repair on a buckle on my wife's shoes. Lots of uses. Zip ties Strap snapped on something? Need to fic something to another thing? Zip ties are handy. Sugru Similar to Formcard, more versatile, though takes 24 hours to set. Sewing kit The ones you find in good hotels are perfect, especially when a button has just fallen off your coat or a shirt. USB drive with important details It's often handy to have a USB flash drive for various uses, including storing passport details etc. A tube of Superglue A handy thing to have if you need to fix something quickly. Flextool Handy little key shaped multitool. No substitute for a proper tool, but this will get through security. Rubber bands I use Field Notes rubber bands around the tin itself. One thing to always bear in mind is make sure you never have anything in here that can get flagged up at airport security. @brendandawes I read this awhile ago cbsnews.com/news/luke-perr… and thought about your Altoids tin brendandawes.com/blog/altoidstin and how you might consider adding some balloons.